Providers are the vendors from whom you order titles. To add a provider record, select Admin > Server Administration > Acquisitions > Providers. Enter information about the provider. At a minimum, you need to add a Provider Name, Code, Owner, and Currency. You also need to select the Active checkbox to use the provider. If you are ordering for a multi-branch library system, distribution formulas are a useful way to specify the number of copies that should be distributed to specific branches and copy locations. To create a distribution formula, select Admin > Server Administration > Acquisitions > Distribution Formulas. Click the New Formula button. Enter the formula name and select the owning library. Ignore the Skip Count field. Click New Entry. Select an Owning Library from the drop down menu. This indicates the branch that will receive the items. In the Item Count field, enter the number of items that should be distributed to that branch and copy location. You can enter the number or use the arrows on the right side of the field. Keep adding entries until the distribution formula is complete. There are several acquisitions Library Settings available that will help with acquisitions workflow. These settings can be found at Admin > Local Administration > Library Settings Editor. Default circulation modifier - Automatically applies a default circulation modifier to all of your acquisitions copies. Useful if you use a specific circulation modifier for on-order copies. Default copy location - Automatically applies a default copy location (e.g. On Order) to acquisitions copies. Temporary barcode prefix - Applies a unique prefix to the barcode that is automatically generated during the acquisitions process. Temporary call number prefix - Applies a unique prefix to the start of the call number that is automatically generated during the acquisitions process. If your library is planning to upload order records in a batch, you need to add some information to your provider records so that Evergreen knows how to map the copy data contained in the order record. Retrieve the record for the provider that has supplied the order records by selecting Admin > Server Administration > Acquisitions > Providers. Click on the hyperlinked Provider name. 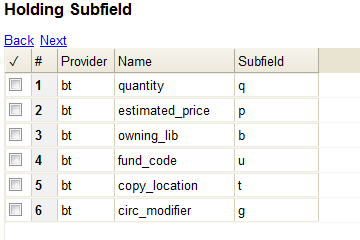 To map the tag’s subfields to the appropriate copy data, click the Holding Subfield tab. Click the New Holding Subfield button and select the copy data that you are mapping. Add the subfield that contains that data and click Save. Configure your provider’s EDI information by selecting Admin > Server Administration > Acquisitions > EDI Accounts. Give the account a name in the Label box. Host is the vendor-assigned FTP/SFTP/SSH hostname. Username is the vendor-assigned FTP/SFTP/SSH username. Password is the vendor-assigned FTP/SFTP/SSH password. Account This field enables you to add a supplemental password for entry to a remote system after log in has been completed. This field is optional for the ILS but may be required by your provider. Provider is a link to the codes for the Provider record. Path is the path on the vendor’s server where Evergreen will deposit its outgoing order files. Incoming Directory is the path on the vendor’s server where Evergreen will retrieve incoming order responses and invoices. Vendor Account Number is the Vendor assigned account number. Vendor Assigned Code is usually a sub-account designation. It can be used with or without the Vendor Account Number. You now need to add this EDI Account and the SAN code to the provider’s record. Select Admin > Server Administration > Acquisitions > Providers. Click the hyperlinked Provider name. Select the account you just created in the EDI Default field. Add the vendor-provided SAN code to the SAN field. The last step is to add your library’s SAN code to Evergreen. Select Admin > Server Administration > Organizational Units. Select your library from the organizational hierarchy in the left pane. Click the Addresses tab and add your library’s SAN code to the SAN field.